Myriad characters whose adventures we've followed and whose personalities we've come to know as well as ourselves. Flawed individuals who've come together even as they've bickered among themselves, walking separately and together on the long and winding road that marked them as earning the mantle of "hero". A road that has led to Avengers: Infinity War. Infinity War is the first half of a culmination of a decade’s worth of cinematic world building. 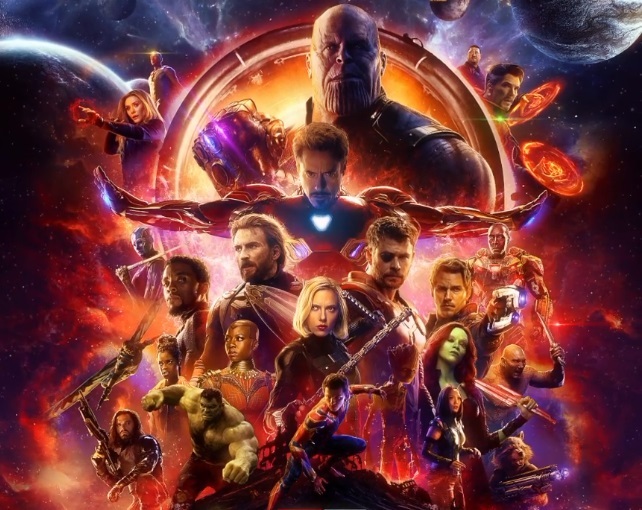 As such, the pressure was on not just Anthony and Joe Russo (and at least 14 credited screenwriters) to deliver, but for all the actors as well. Infinity War is both the end of a beginning and the beginning of an end. If that sounds operatic, then its a designation that befits the film. After years of subplots and teases, the mad Titan Thanos (Josh Brolin) finally makes his bid to collect the Infinity Stones, gems of power which have been peppered throughout the Marvel film narrative. Once collected, Thanos will use the stones to impose galactic cleansing on a universal scale, wiping out life everywhere. It will take the combined might of practically all the heroes of the Marvel Cinematic Universe to attempt to stop him…though not without bitter sacrifice and loss. The Russo Brothers have clearly learned from their missteps in Captain America: Civil War (2016). There are no shoehorned narrative hiccups here. The story kicks off immediately after the events of the tonally-different Thor: Ragnarok (2017) with the speed and power of a rocket launch and, despite moments of quiescence here and there, does not let up. The action and story are so compelling one is barely aware of the two and a half hour run time. It’s visually stunning, narratively arresting, and cannily polished; perhaps too polished for the Marvel Studios naysayers who decry the studio’s “play-by-the-numbers” policy. But the films' flaws are conversely its’ strengths: it’s operatically epic, filled with the bombast and sturm und drang that one expects of an “end of the world” fable. Whether it’s one’s cup of tea or not is based solely upon the viewer’s taste and perspective. Polished it may be, but "safe" it isn't. From the first few minutes of the film, the directors establish that there are no sacred cows and that the phrase of the day is “anything goes”. As befitting the culmination of years-long universe construction, the stakes are as high as they’ve ever been and the fallout is sure to drop. As Steve Rogers’ (a bearded and resolute Chris Evans) disgraced uniform signifies, the film portents dark times. Yet his bearing and carriage also signify the hope and resoluteness that viewers have come to expect, not just from him, but of all the Marvel heroes in varying degrees. Alan Silvestri’s score enhances the contrast between the light and the dark, at turns portentous and uplifting. In truth, there is no “by the numbers” in this one…to a degree (to say more would be to spoil more). An ambitious ensemble piece like this had more likelihood to crumble and fall under the weight of its sheer star power alone. Instead, the actors’ commitment to the film and the Russos’ direction show that, unlike another ensemble wannabe epic illustrated, it’s not the numbers of the players, but the construction of the playbook. And epic, it is. The story moves across a myriad worlds and landscapes, each sub-story working in service of the main one with hardly a one feeling ancillary. The weight of the stakes, and their costs, feel real in this film than they haven’t in a previous Marvel film. It is as emotionally charged as it is visually hypnotic. The visuals are so spot on they deserve the IMAX and 3-D treatment. So much goes on that it teeters on Avengers fatigue (and not of the sort implied by a noted director). It’s may look exhausting, but the film is as exhilarating as any super hero film has any right to be. Further, Infinity War bears repeat viewing. There’s so much spectacle on the screen that moments of subtle import are lost in the shuffle. Character lines foreshadow character moments in a way that hit subconsciously in an effective manner (one moment in particular in the film’s climax comes to this critic’s mind. It won’t be spoiled here. Suffice it to say, it was an unspoken rebuttal to a previous statement that gave the film more power and import than it would have had alone. It was an unexpected example of brilliant storytelling). For all its character numbers and ratcheted action, character development is not sacrificed. Previous subplots from the preceding films are touched upon; some satisfactorily, some less so (but could be forgiven if addressed in next year’s as yet untitled Avengers film), but all respectfully and completely in character. It would be unfair to single out any of the approximately 64(!) main characters of this film here as they all bring their >ahem< “A” game. Yet the revelatory performance here is Brolin’s. It’s not incorrect to say that in all of Thanos’ previous appearances (save for the end tag of the first Avengers, who was played in profile by actor Damion Poitier), implied a standard, two-dimensional megalomaniac waiting behind the scenes. Now front and center, he is surprisingly three dimensional (realistic CGI notwithstanding). He’s a resolute man of singular purpose with, as with all Marvel films in the back half of their run, a totally topical and identifiable reason for his actions even if his methods of addressing same is anathema to anyone with a whit of sanity. Years ago, there was a news story detailing a real life genocidal dictator who showed love and affection for his dog; a marked and incongruous contrast between human being and mass slaughterer. In this fictional universe, Brolin manages to evince the same effect, making his moments of merciless brutality seem even the more terrifying as a result. On top of that, it’s this level of villainy that raises the stakes and, in contrasts, bolsters the actors’ performances as the heroes even further. If there were an MVP award for films, Brolin easily takes it here (while Peter Dinklage would win for “most ironic, tongue-in-cheek casting”). As aforesaid, to say more would spoil more. In this day and age of the almighty entity known as “The Hype”, it is more the case than not to say that very rarely do event films live up to the hype leading up to it. Avengers: Infinity War is a successful exception to that expectation. As aforesaid, it’s no secret that there is one more Avengers film slated with this cast which tells the rest of the story. Yet for all that knowledge, this film is completely satisfying and successful on its own merits. For all its “darkest before the dawn” aesthetic, it is the first of a celebration of an experiment that began with a previously-disgraced actor in an iron suit. The pay-off is there successfully on the screen. Don’t war with yourself. Avengers: Infinity War is a must see.